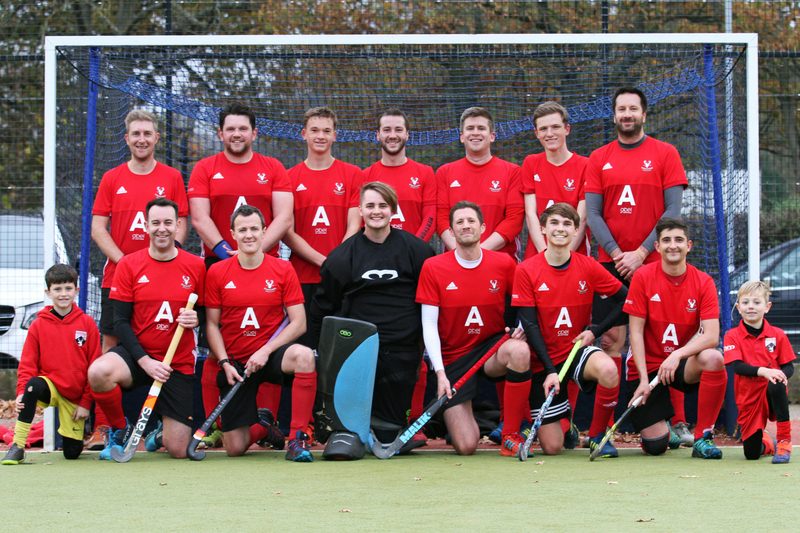 Hertford delivered a crushing performance on Saturday, registering the biggest margin of victory of any match so far in division 2S this season as they dispatched Felixstowe by two goals to ten, with three forwards bagging themselves a hat trick each. Hertford made four changes again this week with Ben Tootell, Taylor Weeks, Nick Downer and Ben van Rooyen being replaced by Elliot Barling, Michael Branford, Luke Rawlinson and Rob Holman. Holman making his competitive debut for the first team after some impressive showings for the 2s in recent weeks. Hertford couldn’t have got off to a worse start. After some high pressing by the hosts Hertford gave away the ball on the right hand side, where it was immediately fired in to the circle for a forward to dart in front of his man and glance the ball onto the backboard past Tom Smith’s left foot to put Felixstowe 1-0 up. After the long car journey to the coast it was the wake up call the Stags needed. After a few more indecisive and uncharacteristic moments, including Simon Halfacre taking an aerial pass down on his chest, they found their rhythm on the quick surface and began to move the ball in triangles at pace in ways that made them hard to live with. A pass out of defence found Darren Norman, who in turn set Arthur Twyning free with a through ball. Barely out of his own half and with three defenders in front of him, the teenager left them sprawling showing some deft lifted skill and a clean pair of heels. On entering the circle on the left hand side it looked like he may have been forced too wide as the goalie closed him down, but a neat spin and roll of the ball from an almost impossible angle saw Twyning registers his first goal of the season to level the contest. It wasn’t long before Hertford took the lead. A penalty corner wasn’t quite on target, but Norman and Scott Apps combined in the second phase with the latter firing into the goal at the second attempt after the keeper had done well to smother the initial effort. Felixstowe pushed forward in search of an equaliser, but when they lost possession in midfield, Apps played a delightful overhead pass putting Luke Camilleri and Norman clear with just the goalie to beat. The Hertford Youth Development Coach practised what he preaches, drawing the keeper and making the easy pass for Norman to walk the ball into the goal. Apps added a fourth not long afterwards, with Norman the provider again, this time working around the left and squaring for his strike partner to control and flick into the net. And it was five before half time as Rawlinson got in on the act. A long corner routine from the right hand side reached Camilleri in the goalmouth, who shifted the ball on to Rawlinson. Despite being forced away from a goal, a firm strike off the back foot beat the keeper at his near post. To their credit Felixstowe weren’t lying down, registering their second on the stroke of half time. The aftermath of a penalty corner was too much for the umpire’s liking, awarding a penalty stroke which was confidently taken. Hertford were made to wait for their sixth as the home side reasserted themselves after the break. Smith was called into action, protecting his goal well, getting good distance on his saves to keep the ball away from danger. Twyning was having a field day, receiving the ball down the line on numerous occasions, toying with his marker, and sprinting off towards the goal. So much so that the Felixstowe skipper appeared to take matters into his own hands by unceremoniously dumping the youngster to the ground off the ball, however the event occurred outside the umpire’s line of sight. Hertford Captain Ian Dunnett - who had been forced to leave the field through injury - was understandably unhappy about the treatment Twyning was receiving, requesting the umpire do more to protect his players. As with the penalty stroke int he first half the umpire didn’t like being questioned, showing Dunnett a yellow card. If anything the period with ten men strengthened the resolve of Hertford as they went on a ruthless streak. Shortly after being denied by a superb stick-save from a fizzing drag-flick, Apps completed his hat trick. An excellent diagonal ball from James Rollins, whose quick decisions making had caught Felixstowe napping on many occasions, found Apps at the top of the circle. His turn left him all alone, and with plenty of time he larruped the ball into the top corner in emphatic style. Darren Norman walked the ball into the goal for the second time as numbers in the D overwhelmed Felixstowe and the ball broke to him at the back post. It was eight not long after as Twyning got the reward his endeavour deserved, clearing up a Norman effort off the keeper for his second. Rawlinson could have had a second when Twyning went on a mazy dribble and pulled the ball back to the penalty spot, but the first time shot sailed over the crossbar. A slick move down the right created the ninth as Norman combined with Dunnett. The final ball was intercepted, but Dunnett won it back and squared for Twyning to slot home to complete his hat trick. Norman completed the scoring, and his own triple, in the final minutes. Another excellent threaded pass from Apps setting him free down the right hand side. Despite having options across the circle Norman had the confidence to slot home under the advancing net minder. Hertford will expect to have a tougher time of it when they host Harpenden, who were promoted alongside them last season, at the Simon Balle ground this weekend. Hertford - Tom Smith; Elliot Barling, Jamie O’Sullivan, Simon Halfacre, Michael Branford; Ian Dunnett, Luke Camilleri, James Rollins; Scott Apps, Darren Norman, Arthur Twyning. Subs - Robert Holman, Luke Rawlinson.